Baylor coach Kim Mulkey cuts down the net in Indianapolis. INDIANAPOLIS — The pain is over, baby. Let the party begin. Baylor “finished the job” in convincing fashion Tuesday night, capping an unbelievable season of firsts with an 84-62 blowout of Michigan State and their first national championship before a crowd of 28,937 at the RCA Dome. “Wow! We’re national champions!” said Baylor coach Kim Mulkey-Robertson, whose team ended the season on a 20-game winning streak to finish 33-3. The players dogpiled at halfcourt and then danced around the court before cutting down the nets in what has become a familiar scene after winning the Big 12 regular-season and tournament championships and NCAA tournament stops in Seattle and Tempe, Ariz. The Lady Bears’ long journey began with last year’s frustrating Sweet 16 loss to Tennessee and ended with one of the most lopsided finals in the history of the NCAA tournament. Young was at her dominating best, finishing with 26 points, nine rebounds and four assists to earn the tournament’s most outstanding player award. But this was far from a one-woman show. Senior post Steffanie Blackmon bounced back from a disappointing semifinal game with 22 points and seven boards, while sophomore forward Emily Niemann knocked down five three-pointers and chipped in with 19 points. Those three alone outscored the Spartans, 67-62, but the Lady Bears also got key contributions from senior point guard Chelsea Whitaker (six assists and five rebounds), sophomore guard Latoya Wyatt (eight points and six boards) and junior guard Chameka Scott (seven points, four rebounds and three assists). More than anything, they won it with defense and rebounding. Baylor completely frustrated the Spartans’ inside duo of Liz Shimek and Kelli Roehrig and won the battle of the boards, 45-22 — the second-largest rebounding margin ever in a championship game. The Lady Bears took control from the start, reeling off eight unanswered points to take a 20-8 lead on a Scott jumper from just inside the three-point line. Niemann, who scored Baylor ‘s first six points on a pair of treys, hit two more in a 10-1 run that stretched the lead to 32-13 with 3:13 left in the first half. Like they did in a semifinal win over Tennessee, the Spartans made a run and cut the deficit to single digits, 32-23, on a reverse layup by Kristin Haynie. But again, Niemann answered. Whitaker penetrated inside and then kicked it back to Niemann, who nailed a three-pointer that gave the Lady Bears a 37-25 halftime lead. The second half belonged to the post tandem of Blackmon and Young. After scoring a combined 16 points in the first half, they were 12-of-22 from the field in the second half and scored 32 points. Michigan State scored the first three points of the second half and got it back within nine again, but they never got that close again. Young scored five points in a 10-2 run, including a spin move inside off an assist from Blackmon, that extended the Lady Bears’ lead to 62-42. Mulkey-Robertson didn’t let up until the last two minutes, when she started emptying her bench. 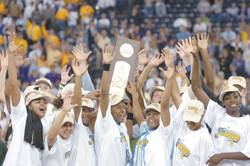 By the end, all 14 players had played in the Lady Bears’ first national title game. When the NCAA tournament comes around each year for women’s basketball, Baylor is almost always listed as one of the favorites.